The Facebook participation is likely a result of the desire to stay in touch, share pictures and watch videos posted by the younger generation of loved ones. The days of physical photo albums are dwindling as parents flood their pages with pictures of their little ones, and friends and family literally watch kids grow up on Facebook. The sites are also becoming less daunting and easier to use, which is attracting the older demographic to the networking trend as they become more comfortable with the idea. When baby boomers hear of their tech-challenged friends joining, they jump bandwagon as well. Aside from the sharing of personal photos and video, the survey also reveals the influence of social media in consumer interaction as the public becomes accustomed to engaging with brands in social media spaces. 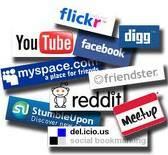 The poll found 29 per cent of social networking participants interact regularly with a consumer brands. And of those, 73 per cent interact with up to five brands, while 21 per cent interact with six or more brands. The increasing participation of the older generation in social media sites means that PR initiatives for brands that target the baby boomer demographic should be adjusted accordingly as this group is no longer solely reliant on traditional forms of media for information. If the trend continues as expected, Baby Boomers will increasingly turn to social media to participate in discussion boards, for information and for consumer dialogue.